Nests are pretty amazing. Every species of bird builds a different nest which exactly matches her own needs. Some are very elaborate and beautiful, others are burrows in the ground while others don’t look much like nests at all. 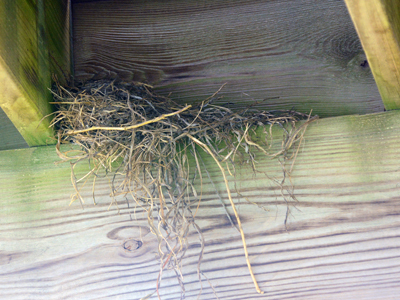 Ever wonder what nest belongs to which bird? Here are a few more commonly found nests and their owners. the lilting sound of the male Baltimore Oriole singing, check the trees for one of their distinctive nests. The females weave hanging nests out of grass, bark and hair. Even synthetic materials make their way into these tightly woven nests. A nest like this one could take the female a week or more to complete. If you find a beautifully crafted round nest which looks like a cup made out of sticks and grass, this is the creation of an American Robin. They line their nests with grass and mud. If you leave some muddy areas in your garden in early spring you will be creating a windfall for these birds. Robins often nest twice, or even three times in a single summer. They usually build their nests in the crook of a tree or on its branches, but you can also find them on the ledges of buildings…sometimes they build nests in a sheltered area like under the porch at your house. One of the least complicated and most poorly thought-out nests are made by Mourning Doves. In fact, some of them consist of a single stick just laid on top of a door. Often the egg has nothing to hold it in place and it falls and breaks. If you have Mourning Doves nesting at your place, if they don’t seem to be building any kind of substantial nest, but placing a stick or two out, you might want to help them by making a nest cone which is a small piece of tight screening shaped in a cone to help them create a nest that will hold the eggs in place. Keep an eye out for bird nests, but be sure to keep your distance. 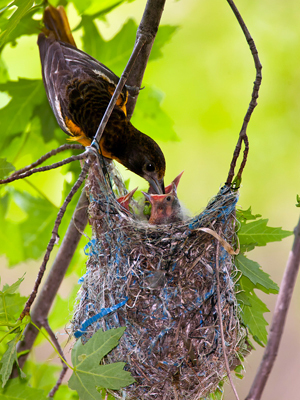 Bird parents can be stressed out if you approach the nest. Just hang back, give the birds their space, and enjoy the show!